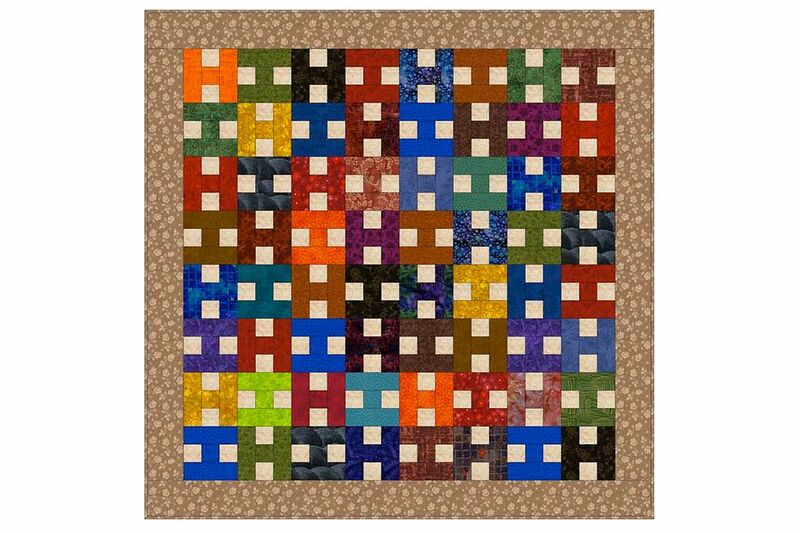 This easy scrap quilt pattern is made from a batch of colorful H quilt blocks, a traditional patchwork design that can be configured in many ways. The H quilt blocks are simple to assemble, especially when you use strip piecing techniques. My Jigsaw Puzzle quilt pattern is assembled using H quilt blocks, too, but by following slightly different instructions that make the puzzle pieces stand out from the design. Each small H unit finishes at 4-1/2" x 4-1/2" and (if assembled as shown) are arranged into blocks of four units each. The quilt finishes at about 42" x 42". You'll assemble sixteen multi-unit H blocks from 64 individual H units. Yardages and cutting instructions result in four small H units from each set of fabrics but you can make a scrappier quilt by changing the cuts (see below). Take a look at Debby's H Quilt in the Scrap Quilts Photo Gallery for a bit of inspiration. Choose vividly colored and dark prints (tone on tones or other small prints that read as solids) for the H units (don't be afraid to throw in some warm golds and oranges) and a light neutral background for the little squares that help define the H. Choose another neutral, somewhat darker than the first, for the border and binding (neutrals help the brightly colored H units pop out). For a scrappy quilt that is not strip pieced. Square up one end of a bold/dark 2" strip and then cut eight 5" long bars from it. Gather the 2" x 8-1/2" strip cut previously from the same bold/dark fabric and (2) light neutral bars of the same size. Sew the three 8-1/2" long bars together lengthwise as shown, placing the dark fabric in the center position. Press to set the seam. Press seam allowances towards the dark bar. Square up one end of the strip set you just made and then cut four 2" wide segments from it. Arrange a strip pieced segment vertically as shown, lower left. Sew a 5" long bold/dark bar to each side of it. Press seam allowances towards the dark bars. Make three more identical H block units from remaining components. Repeat with remaining fabrics to make a total of 64 small H block units (sixteen groups of four). Sew four small H units together as shown to create sixteen larger blocks. If you prefer, arrange all 64 small units on a design wall or other flat surface before sewing them together. Shuffle the smaller units around until you are pleased with the layout. Sometimes it helps to leave the room for awhile or leave the design wall intact overnight. Look at the arrangement again. Keep shuffling the patchwork around until you're happy with the quilt. Assemble the blocks in groups of four as shown on this page, pressing seam allowances towards solid bars in each group of two. Place each group back into its slot and you work on the next. When all blocks are assembled, sew the four blocks in each row together. Press and then connect the rows. Match all seam intersections carefully, using straight pins to keep fabrics from shifting when necessary. Use my straight borders instructions to measure and sew borders to the quilt. Borders are an opportunity to square up a slightly skewed quilt so be sure to measure and sew as explained in the tutorial. Use 3-1/2" wide strips of the darker neutral to make the border. Mark for quilting if necessary. Sandwich with batting and backing and baste the layers together before quilting the quilt. Square up the outer edges if necessary and bind with doublefold binding. For a larger quilt, adjust yardage upwards and keep sewing groups of blocks. The H quilt makes a colorful quilt for a baby or small child. Bold fabrics on a light neutral background help the H shape pop out at you.